Here's the information for the upcoming project at the Poor's Farm on Bissett Road. We will meet at the parking lot by the big red barn - map - at 8:30 each morning and then head to the site. The digging will stop at 3 p.m. and we will have equipment cleared up and be out of there by 3:30. Text directions: Take Cole Harbour Road to Bissett Road. There's a sign for "Cow Bay" at this end of Bissett Road. 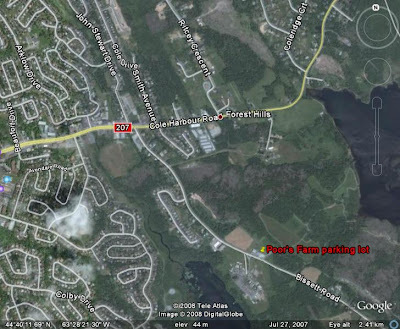 Turn onto Bissett Road and travel roughly 1.3 km to the Big Red Barn (you can't miss it). There's a nice big parking lot surrounded by a log fence right beside the Barn. Park here. If you get lost you can call my cell: 902-956-4247. Digging equipment will be provided, however I would ask you all to bring: sunblock, a sunhat, bug spray, gloves, an ample supply of water and your lunch and snacks. We are expecting two school groups through the week and, hopefully, more interested members of the public and, perhaps park-using passers by. Thanks to everyone who has made the early commitment - especially at the headwater of the torrent of the summer field season. At this point, looks like we have sun....keep your fingers crossed! Ms. Sarah Kingston is basing her master's thesis in the Atlantic Canada Studies program at Saint Mary's University on this project. Her topic is Public Archaeology and she may ask if you are interested in filling out a questionnaire to assist her in her data gathering efforts. Your participation in the questionnaire is PURELY voluntary. These questionnaires have been reviewed and approved by the Research Ethics Board of Saint Mary's University. And last, but not least: we still have room for volunteers from the general public. We have enough equipment and supervisors for about 17 - 20 people to dig at the same time (however if we have more volunteers than trowels, we can always offer artifact washing). If you know of someone who might like to come and dig, wash or chat with the park visitors about the work, please tell them they are more than welcome and just to drop me an e-mail or give me a call so I can maintain a reasonable schedule of personnel and equipment. In fact, some who are receiving this e-mail have not yet selected days they'd like to participate or even (yet) said they would :-), so please do contact me if you would like to come out and contribute to this celebration of the 20th Anniversary of the Nova Scotia Archaeology Society and the importance of archaeology to this local site and the wider community of Cole Harbour and beyond. You can find a little history of the Poor's Farm here. Looking forward to seeing everyone, having a great time and doing some good research for a truly special site.